Wonderful views to front and rear. Located in the Sought After Village of Dinas Powys. Caerwent Gardens is an exquisite collection of 2,3 & 4 bedroom homes set amongst the delightful and much sought after location of Dinas Powys. These homes have been cherry picked to showcase distinctive exteriors and thoughtfully designed interiors. The interiors have been redefined by harmonising the use of space with our inclusive specification. With well-appointed living and resting areas to generous kitchen cupboards and appliances, en suites and fitted wardrobes to the master bedroom, these homes offer an unrivalled living experience. The development itself offers wonderful countryside views to front and rear across farmland and amenity parkland to front benefitting from lawns, sculptures and is extremely child friendly. 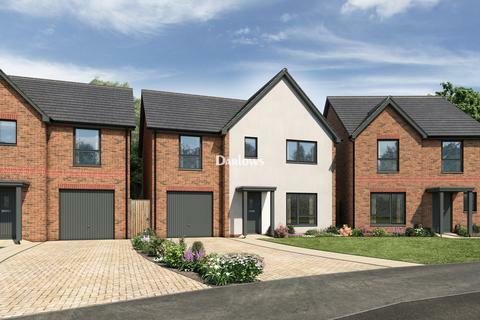 The development is located within the charming and sought after village of Dinas Powys in the Vale of Glamorgan. The history of Dinas Powys is steeped in antiquity with people having occupied this picturesque wooded river valley since prehistoric times. Dinas Powys village facilities include a wide range of shops, leisure facilities including tennis club, bowls club, rugby club etc and benefits from a railway station linking to Cardiff City centre. The good local road network brings major centres including the capital city of Cardiff, Newport, Swansea, Bridgend, Llantrisant, Barry, etc all within comfortable commuting distance. Outside - Blocked paved driveway. Front and rear turfed gardens. Patio (1.8 x 1.8) in Buff Riven slabs. 1.8m board fencing. Side gate access. External Features - Composite front door with security lock and chrome effect furniture. Double glazed UPVC windows. Door numerals. UPVC rear glazed door with security lock (subject to plot). Door bell. Outside lights to front and rear. Paving slabs to patio. Block paved driveway. Outside tap to rear garden. Turf to front and rear garden. 1.8m close board fencing panels to rear gardens. Internal Features - Ceilings finished throughout in white emulsion. All woodwork including stairs, spindles and handrail in white gloss finish. Almond white emulsion to all internal walls. Internal doors pre-finished in white with chrome furniture. Fitted wardrobes to master suite. TV points to lounge, master bedroom and kitchen. BT telephone points to lounge, master bedroom and kitchen. Warranty - All homes come with a 10 year NHBC Guarantee and 2 year Customer Service support. Services - Mains water, electricity, gas and drainage. Property reference 28629150. The information displayed about this property comprises a property advertisement. OnTheMarket.com makes no warranty as to the accuracy or completeness of the advertisement or any linked or associated information, and OnTheMarket.com has no control over the content. This property advertisement does not constitute property particulars. The information is provided and maintained by Brinsons & Birt - Cowbridge. Please contact the selling agent directly to obtain any information which may be available under the terms of The Energy Performance of Buildings (Certificates and Inspections) (England and Wales) Regulations 2007 or the Home Report if in relation to a residential property in Scotland.